German banker; born at Breslau Nov. 3, 1760; died Feb. 20, 1839. The son of poor parents, he rose to a position of wealth and eminence by his talents and energy. He settled at Carlsruhe during the stormy years at the end of the eighteenth century. Many of the larger German national loans were effected through him, and he was instrumental also in founding some of the industrial enterprises of the grand duchy of Baden. After being appointed court banker by Grand Duke Karl (1811-18), Grand Duke Ludwig conferred upon him (1829) a patent of hereditary nobility. In 1816, and again in 1819, the ancient prejudice against the Jews that was threatening to break out into open hostility in Carlsruhe was held in check by Haber, who used his influence and position to shield his coreligionists. Haber was instrumental in the founding (1818) of a "Cultusverein," which conducted services on the Hamburger Temple plan. 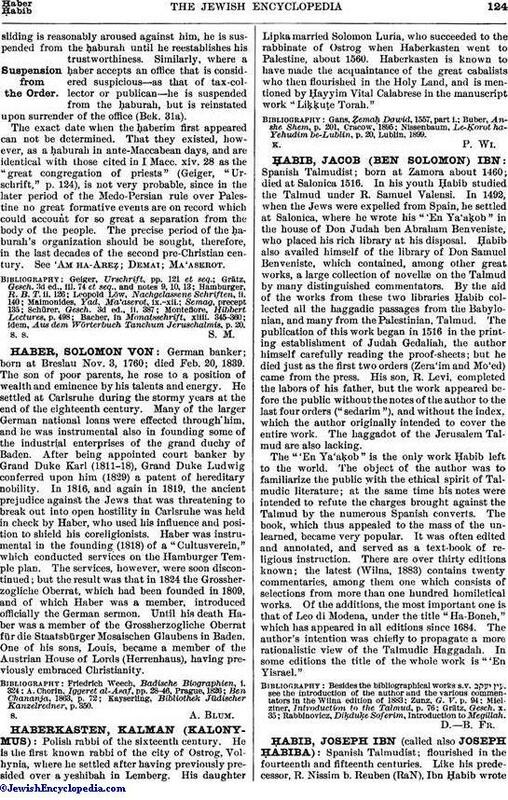 The services, however, were soon discontinued; but the result was that in 1824 the Grossherzogliche Oberrat, which had been founded in 1809, and of which Haber was a member, introduced officially the German sermon. Until his death Haber was a member of the Grossherzogliche Oberrat für die Staatsbürger Mosaischen Glaubens in Baden. One of his sons, Louis, became a member of the Austrian House of Lords (Herrenhaus), having previously embraced Christianity. Kayserling, Bibliothek Jüdischer Kanzelredner, p. 350.